Do you love Opera music? 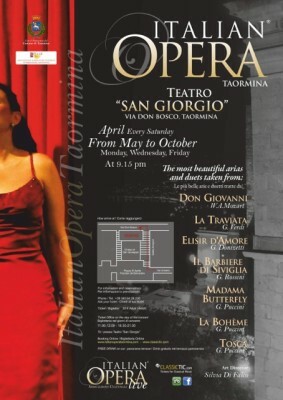 The artists of the Italian Opera Taormina perform every week in Taormina. More than one hour of timeless arias from some of the most famous Italian operas. An extraordinary journey with the most famous arias and duet from “Italian Operas”. You will hear music from great Italian operas interpreted by professional singers who have performed in the most important Italian and international theatres, performed with piano accompaniment. The evening will be held in the Cine Teatro ‘San Giorgio’ where you will be offered a drink and can take in an extraordinary panorama view of Taormina.